SUMMARY: Aggregate data from health risk assessments (HRAs) provide a snapshot of population health status that guides healthcare payors, purchasers and providers in the design of health improvement or DM initiatives. We wanted to find out how many healthcare organizations penalize individuals who do not take an HRA. 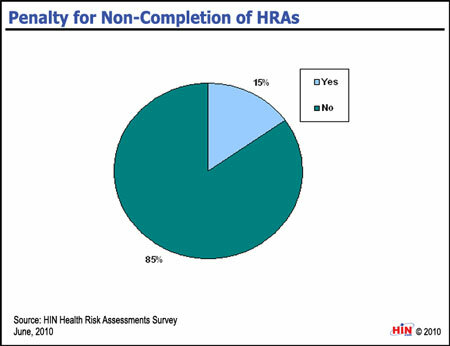 The Healthcare Intelligence Network's June 2010 Health Risk Assessments e-survey captured trends in the use of HRAs  from format and target audiences to incentive use and impact  by 116 healthcare organizations. Download the executive summary of 2010 Performance Benchmarks in Health Risk Assessment Use . 2010 Performance Benchmarks in Health Risk Assessment Use provides metrics and measures from 116 healthcare companies on current and planned HRA initiatives as well as lessons learned and results from successful health assessment programs. Presenting the data in 60 easy-to-follow graphs and tables, this industry snapshot is enhanced with guidance from industry thought leaders on the design and implementation of HRAs, the role of an HRA in a population health management program and guidelines for evaluating the effectiveness of HRA programs. 2010 Performance Benchmarks in Health Risk Assessment Use is available from the Healthcare Intelligence Network for $117 by visiting our Online Bookstore or by calling toll-free (888) 446-3530.